Where is your “here” and what “there” are you striving to reach? Several months ago, I participated in a Mastermind Group / Book Club exercise with some people from an organization I belong to called Outside Counsel. The books was What Got You Here Won’t Get You There by Marshall Goldsmith. I loved it! Goldsmith describes 20 behaviors that cause people to get stuck in their careers (although work life is really the focus on the book, Goldsmith acknowledges these behaviors permeate all aspects of a person’s life), even though the behaviors may have actually served the person well at an earlier point in his/her life. This made a lot of sense to me, as I have lived it. I grew up in circumstances that drove me to become a very self-sufficient, independent, over achiever. I did everything myself, not expecting or accepting help from others, because I had learned — from experience — that you couldn’t necessarily count on others to be there when you needed them. The behaviors I built around these beliefs served me well for a long time in my younger years, and even for a while when I entered the working world after college. I reached a point, however, when those behaviors no longer served me and, in fact, became destructive. You see, it’s not possible for one person to be completely self-sufficient, to be all things to all people, to be an expert in everything. And, frankly, it was exhausting! I eventually went through some painful experiences that caused me to become more self-aware and to effect some significant changes in my life. I changed my thinking about needing other people, inviting them into my life and my work, asking for help, and understanding that the end result of working with others is much more than I can accomplish solo. This is the foundation for a keynote presentation I gave today at the Mid-Ohio Valley Chamber of Commerce’s second annual Women in Leadership Luncheon. I used my story and intertwined it with the concepts Marshall Goldsmith so eloquently outlined in his book, and offered it to the ~160 attendees as a learning opportunity. It was truly the highlight of my week, so far. I have to admit, I’ve been looking forward to this day for some months now, as I felt so lucky when the Chamber’s Executive Director accepted my suggestion for using it as the theme for the luncheon. 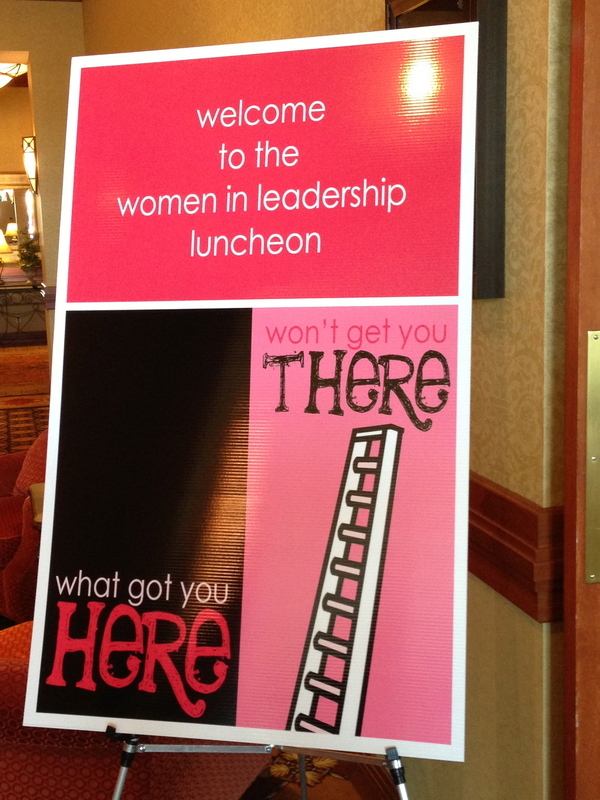 I had a great time working with the luncheon’s planning committee; a diverse group of talented, creative, focused women who planned and presented a great day of learning and connecting opportunities for the business women of this area. My intent was for each person to have at least one aha! moment, one new insight, a new perspective, and that when they left the conference center today, they could say without a doubt, “Attending this event was truly worth the six hours of my life that I spent on it today.” You see, I do strive to entertain people when I have the opportunity to speak, but more than that, I want to make people to think, to learn, to grow. I want to share something that will have changed someone’s life, even if in just a small way. I encourage you to take a few minutes right now to think about your current “Here”…not your physical location, but where you are in your work, your learning, your relationships, your growth, your career. Then give some thought to the next “There” you long to get to. What will it take to get you there? What skills will you need to develop? What behaviors will you need to stop demonstrating? What behaviors will you need to cultivate? Click here to see the newspaper coverage. Further into Ed Gungor’s book, One Small Barking Dog, I encounter the section on Courage. This is big, isn’t it? Gungor states we need courage not only to face ordinary life, but to confront the places where we have been broken emotionally or psychologically. These kinds of experiences can be toxic and the residue has the power to poison our lives for many years to come…if we don’t do the work we need to do to get past them. Exercising courage isn’t quick, easy, or painless. It takes a certain level of fortitude, persistence, and determination. And yet, millions of people demonstrate courage daily. Responding to a situation means we think about what has happened and what our options are in taking some action after. It allows us to consider the risks, benefits, implications, and consequences of our words and actions BEFORE we speak or take them. To simply react is to allow our emotions to take over and when we react, we often speak or act without thinking, and the results can be painful, dangerous, damaging, destructive to ourselves and others. I was once very close to a person who chose to become a victim. According to him, everything in his life was the result of luck — mostly of the bad variety. He believed he was unable to influence the things going on around him. And the resignation of this position was quite damaging to him; I believe it lead to depression and despair. It was quite damaging to many of the relationships he claimed to hold dear. As the person on the outside looking in, it was very draining for me just being in proximity. Of course, the other side of this is that his belief is 180 degrees away from my belief. I believe I have the power, ability, and responsibility for what happens in my life. Don’t misunderstand – I have no illusion of being in control of what happens. I believe I have the power to influence what happens. I have the ability to choose how I respond to what happens. And I take responsibility for the choices I make, the way I respond, and what I will do going forward. I’m not saying I don’t have bad experiences, but the effects typically do not linger long. I find it wasteful to wallow. There’s much to be done and I’m not at my destination, yet, so I must get back up and keep moving forward. I have been wounded, I have been broken, I have felt lost. But even after my most heartbreaking experiences, I have woken up the next morning to a new day and the realization that if I am, indeed, still here, there must be something I am meant to do…So, I get up and get moving. Courage means we don’t bury the pain, the hurtful experiences, the negative voices in our heads; rather it means we must confront them. Bring them into the full light of day and see them fully. It’s not easy to get to the root of some of our most self-limiting beliefs, but we are well served to spend the time in reflection, get to some understanding, and commit to moving forward to becoming the best possible version of ourselves possible. If you are feeling some pain, consider it a gift. It’s telling you something very important. If you listen to it, explore it, come to terms with it — face it with courage, you will emerge better for the experience on the other side. As the small dog would do (and I witnessed my small dogs — Bean-dip and Houdini — do on more than one occasion), brace yourself; bare your teeth; growl if it makes you feel better; and face your life head on, with courage. Have you ever spent much time with a small dog? Did you notice the air of self-confidence they exude? To them, external measures are meaningless, as Ed Gungor says in his book One Small Barking Dog. And this, I can say was unequivocally true, at least for one of my two small dogs. Bean-dip came first. She actually belonged to the neighbors when I bought my first house. They left her alone in the yard, all the time, regardless of the weather, with no suitable shelter. She would find ways to escape the fence and run to my doorstep, where she would sit and whine until I heard her and let her in. And let me tell you, once she was in, she OWNED the place! And after a few “visits” the neighbors decided she didn’t need to come home anymore. She was brash and ferocious and assertive; afraid of nothing. I remember vividly the day she chased a full-sized garbage truck through the neighborhood barking up a storm as she ran…presumably saving the neighborhood from the foul-smelling, giant contraption. She was a Chihuahua-terrier mix, weighing a solid nine pounds on a good day. I don’t have a picture of her with me today, but if you want a visual, think “Taco Bell dog” from the late 1990’s! Contrast her to Houdini, who I mistook for Bean-dip one rainy evening on my way home from work, silhouetted in the lights from on-coming traffic as he scurried across the road in front of the cars. I thought she had escaped the yard, only to discover this dog was male, an inch or so taller, and thinner than Bean-dip. Same short buff fur, and although according to the vet, he was a Basenji-Terrier mix, they looked like siblings. He was the quiet, gentle small dog, also confident in himself, but more interested in a cozy spot to nap than he was in taking on the world. One lesson they reminded me of, frequently and in a variety of situations, was that small wasn’t less important or valuable than big, it was just different. But we live in a world that seems to compel us to continuously compare things, and sometimes one thing in that equation will be deemed of lesser value. Often it’s the smaller thing, isn’t it? Just look at our cars and houses, our drive to accumulate more things, consider the so-called “value meals” in restaurants with ever-increasing portion sizes (of food that’s not necessarily good for us to begin with! )…but tell me, do these things equate to happiness, contentment, satisfaction, joy, and increased self-confidence? I can speak for only myself, and my answer is “no.” Sure, I enjoy having nice things; I work hard, I buy quality, and I take good care of my things. But I have no misconception about what they are and what they represent. I need to be the right kind of person with a good heart and a giving spirit regardless of how I dress or what stuff I have and no amount of “stuff” is going to make me happy. When I was working on my Master’s degree, there was a young man in my program. He was from Europe, very nice looking guy and smart. I soon learned he was also missing something significant. He was constantly buying things and when I say things, I don’t mean $10, inconsequential things (although he bought that kind of stuff in excess, as well), but I mean high-end expensive items – electronics, watches, clothing – and the labels and logos were very important to him; he bought whatever was considered the best at the time. One day, he was supposed to stop by to help with a house project. He pulled into the driveway in a brand new Jeep, one of the sportier models, fresh off the lot! He already had two other (not inexpensive) cars, and a motorcycle, if I remember correctly. He was bored, he said. Stopped by the car lot just for fun, and voila! He was now the proud new owner of this Jeep…that he couldn’t afford (his debt was staggering, and his compensation no match for what his monthly payments must have been)…and the next week, he was on a quest for the next thing, that next acquisition he was sure was going to make him happy. What do you think about the power of the small dog? And how does the “big dog lie” play out in your life?